Premium Quality ERC02Bk Black Printer Ribbon (6pk) compatible with the Epson M-210, M-215S, TM-210, TM-215 POS. The use of compatible supplies does not void your printer warranty. Premium Quality ERC02BR Black-Red POS Ribbon compatible with the Epson M-210, M-215S, TM-210, TM-215 POS. The use of compatible supplies does not void your printer warranty. Premium Quality ERC02P Purple Printer Ribbon (6pk) compatible with the Epson M-210, M-215S, TM-210, TM-215 POS. The use of compatible supplies does not void your printer warranty. Premium Quality ERC-02PR Purple-Red POS Ribbon compatible with the Epson M-210, M-215S, TM-210, TM-215 POS. The use of compatible supplies does not void your printer warranty. 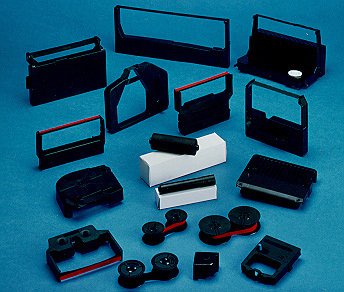 Premium Quality ERC-03 Black POS Ribbon (6 pk) compatible with the Casio (POS) M 210V, M 220, M 240. The use of compatible supplies does not void your printer warranty. Premium Quality ERC-03P Purple POS Ribbon (6 pk) compatible with the Epson M 210V, M 220, M 240. The use of compatible supplies does not void your printer warranty.